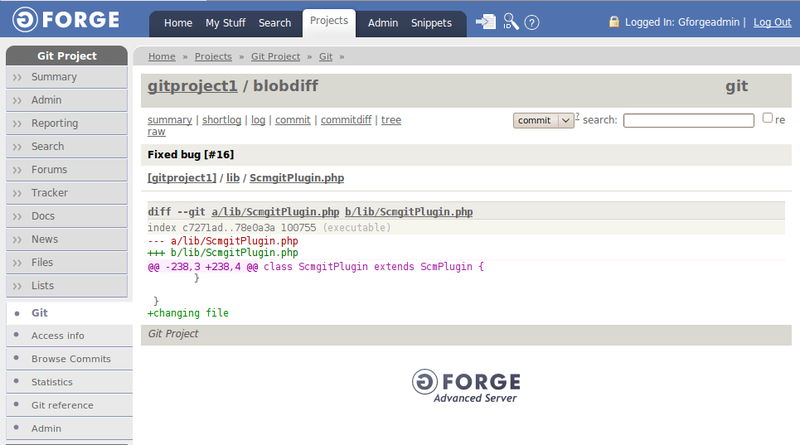 GForge provides full support for the git SCM (Source Code Management) tool, in addition to SVN and CVS. Unlike SVN and CVS, git is a distributed tool where each user has a copy of the full repository in his or her machine. The basic workflow of git involves committing changes against the local repository and sharing the changes via pull and push operations. Since commits in the local repositories cannot be “seen” by the GForge server, GForge sets up a global, centralized (“bare”) repository where the changes can be pushed to. 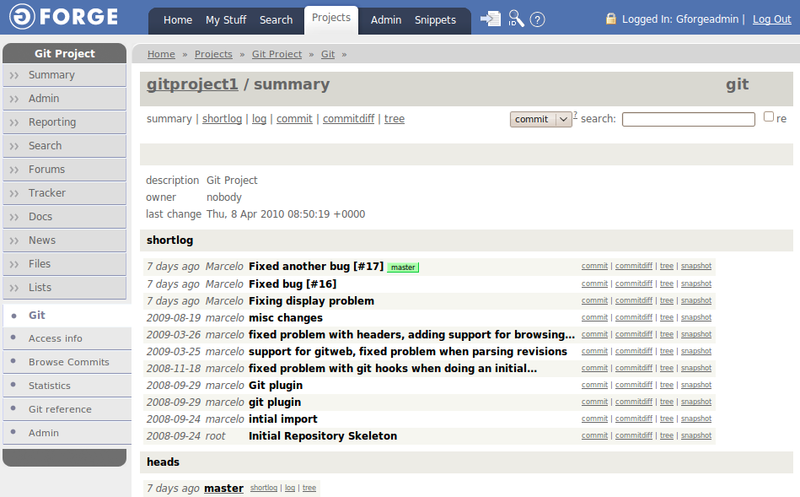 To enable git support for your project, you need to be logged in as a project administrator. Get into the “Admin” section of the project, and select “GIT” as the SCM tool. Click the “Submit button”. 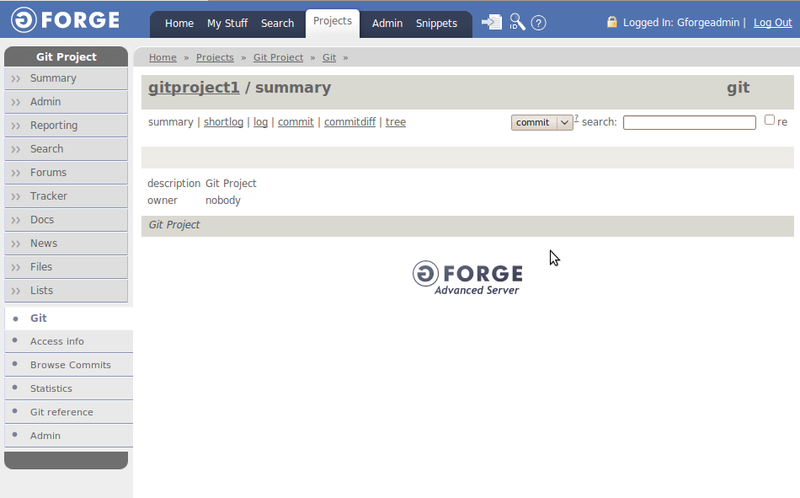 This will create a bare git repository in the GForge server. This may take up to 15 minutes, you can check if the repository was created by clicking on the “Git” section in the project. If you get the message “The SCM repository for this project hasn’t been created yet”, you need to wait a couple of minutes. At this point, the git repository is empty and is not very useful, so some data must be imported first. You will have to push an existing local git repository into the GForge repository. This is a working directory with the source code and the git repository is stored under the .git subdirectory. Note that the URI that’s used to clone the repository is the same you’ll use to push the changes. Compressing objects: 100% (104/104), done. Writing objects: 100% (113/113), 86.39 KiB, done. Note that this will only push the master branch to the repository. Receiving objects: 100% (113/113), 85.51 KiB, done. This will create a directory with the project’s name (in this case gitproject1) with a local copy of the full repository. ~/gitproject1$ git commit -a -m "Fixed bug [#16]"
~/gitproject1$ git commit -a -m "Fixed another bug [#17]"
Writing objects: 100% (8/8), 777 bytes, done. Now, when you browse the git repository in the GForge project, you will be able to see the commits you’ve just pushed to the server. You may have noticed in the previous example that when we committed, the commit log included the special marker “[#16]”. GForge parses the commit logs and, whenever it finds such a string, it associates the commit with the specified item number, in this case 16. The Access Control Lists (ACLs) provide fine-grained permissions control in the source code repository, allowing you to specify read and write access for the different users in your project to different directories in the repository. To set up an ACL for a directory, go to the Project’s git admin section by clicking on the “Git” section and then “Admin”. This will enable a new menu item “Edit repository ACLs”. Clicking on this item will take you to the ACL administration page. gitproject1$ git commit -a -m "Fixing stuff"
Writing objects: 100% (7/7), 690 bytes, done. In this example, the user has write access to the repository but the access to the /lib directory is read-only, as shown on the previous screenshot. The commit filters are custom scripts that run when a push is done against the repository in order to do code checks and any other action you want. To define a commit filter, you need to be a site-wide administrator. 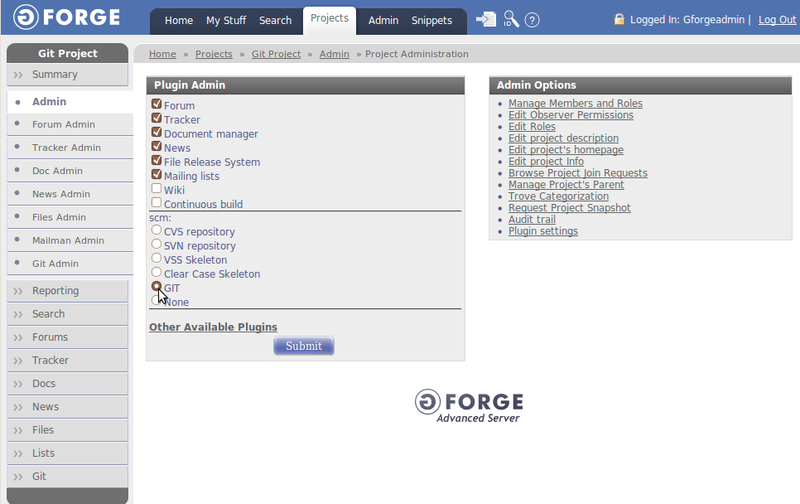 On the Admin section of GForge, click on the SCM commit filters link under the Plugins tab. This will take you to a page where you can define the filters. Command: The command to execute when a push is done against the server. This needs to include the full path to the script in the server and any additional parameters. $PATH: The full path to the repository, usually /gitroot/<project_name>. Once the script is set up, you need to enable it in your project. Go to the project’s git admin page and click on the Edit commit filters link. In there, you can use the checkboxes to select which filters will be applied in your repository.